2005-06 summer, and there was still much interior and exterior finish to do (MC). Well, let's start from the beginning with the above photo. 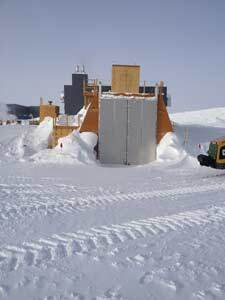 On the surface, the structure was originally needed to house huge dewars of liquid helium that would be flown in from McMurdo (or New Zealand) to keep the several telescopes in the dark sector supplied through the winter. But several things happened. First, the technology used by the submillimeter telescopes in the dark sector evolved...so that they could recycle and cool a closed-system helium supply to liquid, rather than require a liquid He resupply. And meanwhile...there was a tightening of the air transport restrictions for those large dewars...which meant they could no longer be flown to Pole. So, in a way, the cryo facility was already obsolescent when it was brand new. It was constructed in 3 sections, the splits are visible in the above photo. 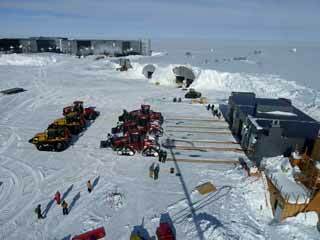 The two end sections were separate modules put together elsewhere...in fact, the shell of the downwind module (closest to BIF) was sitting between B3 and B4 during the 2005 winter (we even had a party or two inside of it). 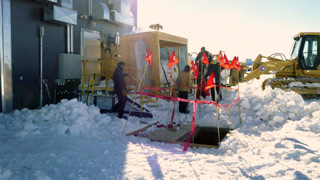 The center section was erected in place after the south module had been moved next to cryo (2005-06 construction photos). 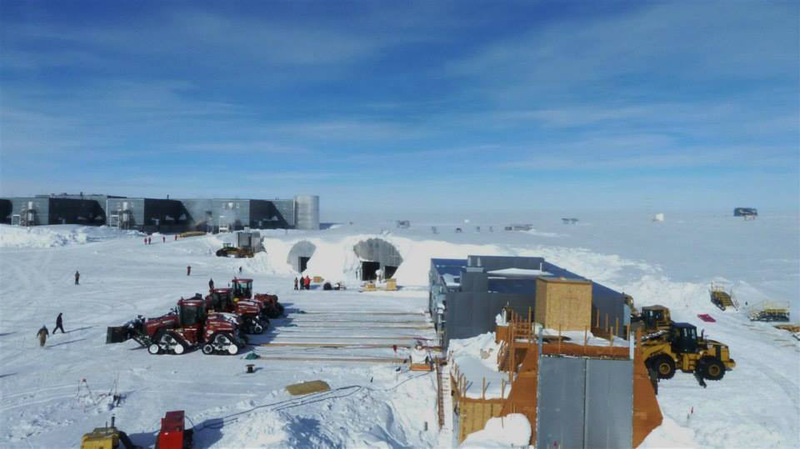 And the unfinished upwind module was sitting next to BIF during that winter...housing two of those large dewars then in use (photos). Back to 2014-15...the real underlying cause for moving cryo was...well, an underlying cause. 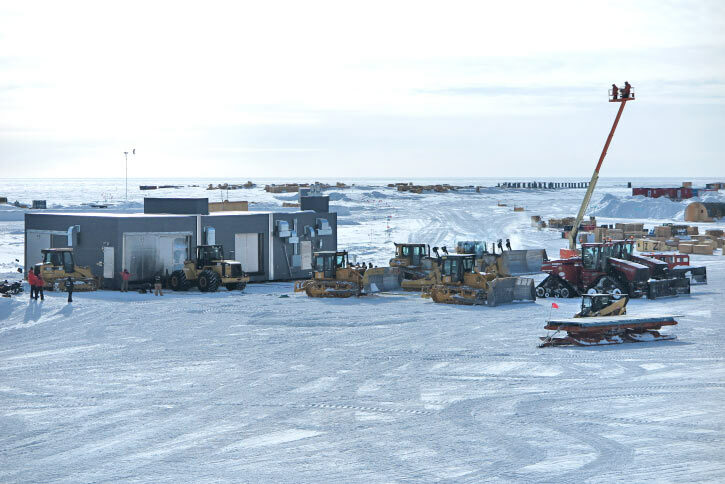 Once upon a time back in 1992-93, the first rodwell was developed downwind of the domed station...close to where the east side (back side of the above photo) of cryo and the BIF now sit. After the second rodwell was put online, rodwell#1 was turned into the sewer bulb. Which slowly filled up...and eventually filled up into the firn (and the ice tunnels) during the 2014 winter, causing the BIF and cryo to, uh...start to list. The immediate structural impact was more evident in the older and more lightly constructed BIF, as cryo has a stiffer steel base frame. Also, the snow buildup in the gap between cryo and BIF caused some distress in the north wall of BIF. 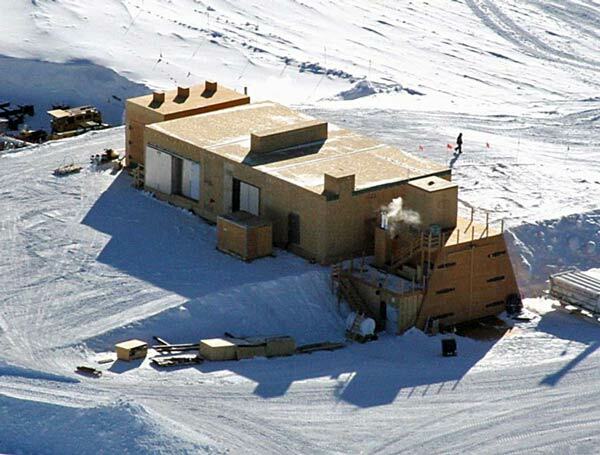 When cryo was designed, the original plan was to erect it directly next to BIF, and at the same elevation. 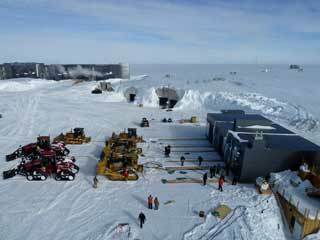 This would have required either digging out the foundation location of cryo or raising BIF. In the end, neither was done. 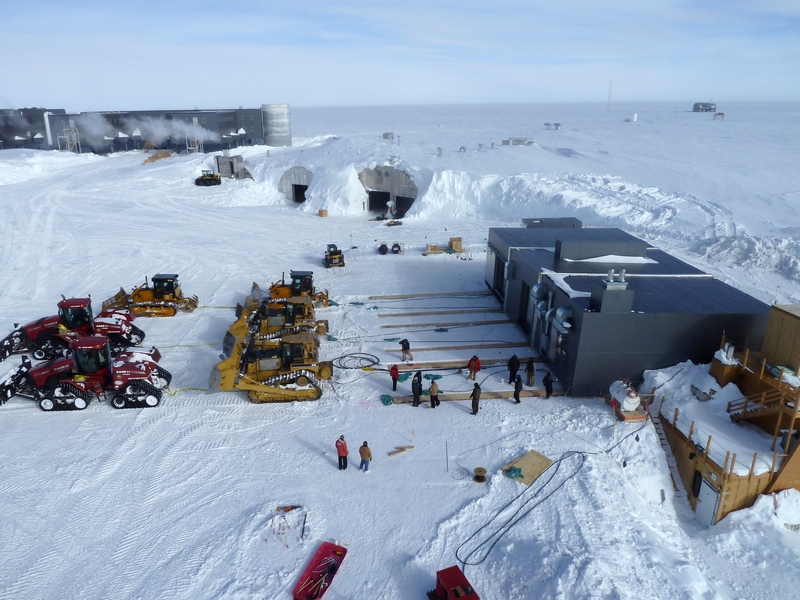 Preliminary planning for the BIF replacement had been underway for at least several years before the 2013 austral summer. But then, sudden plans for its immediate condemnation and demolition were voiced. As that would have been fairly catastrophic to the met and NOAA programs...the immediate condemnation plans were rescinded for the moment, despite the significant structural distress. 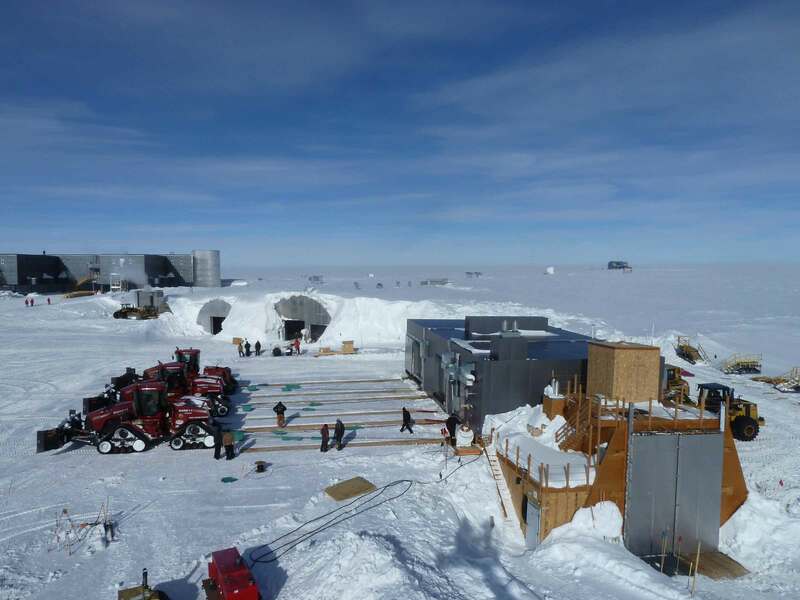 At right (BB), notice the settlement of BIF relative to cryo...not to mention the significant snow drifting--another issue in itself (more on some of the discussion items at some future time). 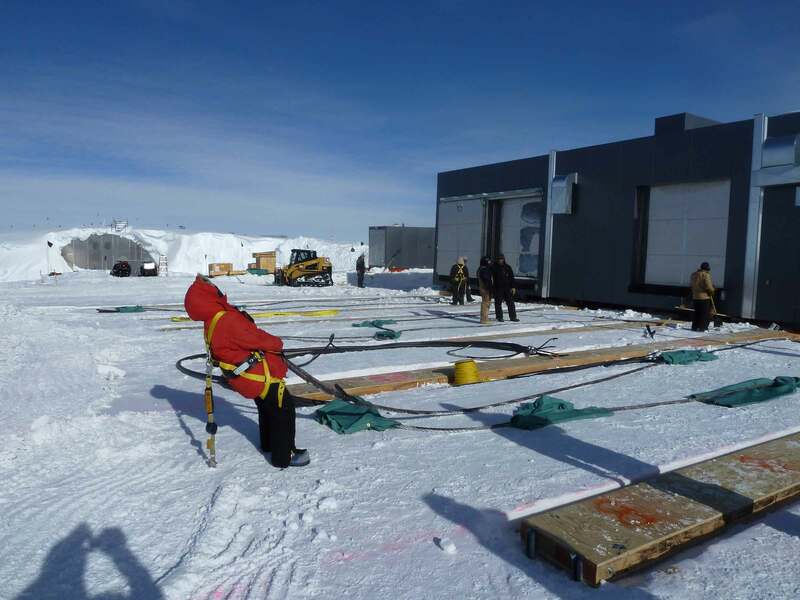 One option considered was to convert the downwind bay of cryo. So perhaps because of that, or merely to move cryo away from the settlement zone, the decision was made to move cryo about 50 feet west (toward the skiway) during the 2014-15 season. Moving day was to be 27 December 2014...selected in part because the South Pole Traverse was in town with some extra horsepower. The move would require several attempts. Some of the preliminary preparations...I don't ever remember seeing that vault (which isn't visible in the other photos) so I'm guessing it was a new electrical vault created to splice cables. The new extended foundation piers visible in the photo at right have not yet been placed (BM). This "attempt" (by 2015 winterover science tech Marissa Goerke who was the source for most of these photos) obviously didn't work. But one can see the rigging laid out, and the extended foundation piers (MG). First attempt. Three SPoT Case tractors in front...several pieces of Pole wheeled and tracked equipment in back. Fail. Here is another view from a slightly different angle...(MG). Second attempt...SIX traverse vehicles in front, and some Pole dozers in the back. Again, fail (MG). The scene after the move...the modules pulled apart a bit during the move; here a couple of tractors are pushing them back together. 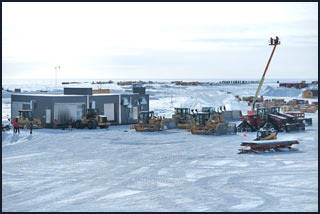 The aerial lift you see is where Marissa was taking her photos (EB). Next: over in the dark sector the remains of the VIPER telescope structure were removed.